Opening up a discussion about this historic storm that was on its way and why it would be so devastating could have occurred. They could have ventured into an important scientific discussion about how the planet is changing. It is not that one should have expected this from a media that has significantly ignored climate change or helped to ensure people continue to doubt whether the science is true. It is just to state what should be obvious: there was a time before people were dealing with damage and flooding and rescue operations that people could have thought about what was imminent. Going through media coverage, it is clear the media collectively failed. With the exception of alternative or independent programs like “Democracy Now!” there was little attempt to connect the dots for viewers. In fact, a few editorials merit attention because what they say could be considered worse than if they had decided to not mention or hint at climate change at all. The acknowledgment seemed to suggest Hurricane Sandy was completely natural and that humanity has played no role in fueling conditions that are producing extreme weather. Moreover, there’s naïve optimism to the Post’s editorial that mankind will be able to come together and cope and that is the best way to respond. …As America’s mid-Atlantic seaboard recovers from hurricane Sandy, even more lessons will be learned in adaptation and preparation. Communities will rediscover the bonds that matter and the civic actions that will protect all people in the future. That is a lesson to take from Hertsgaard’s book but not the lesson of Hertsgaard’s book. If one reads it, Hertsgaard writes on the current cultural, economic, and, most importantly, political trajectory, effects of climate change will get worse before they get better. The conditions will become truly unmanageable if significant cuts to global greenhouse emissions are not made. So, Monitor’s editorial sterilized the message to fit a society in collective denial on the issue of climate change. Yes, Hertsgaard communicates the reality that humans will have to learn to adapt to climate change conditions because it is too late to stop some of the effects. There should be action to help societies or communities adapt but not while at the same time ignoring political realities and avoiding crucial discussions on climate change that should be had. Some media here and around the world did appropriately mention climate change. The Sydney Morning Herald covered Sandy with attention to climate change. Paul McGeough, chief foreign correspondent, called attention to this development on Earth, “The loss of sea ice opens large expanses of open water, which then absorbs more of the incoming solar radiation and adds heat and moisture to the atmosphere, thereby helping to alter weather patterns.” The loss of sea ice, which can be attributed to climate change, fueled the fury of Sandy. …To begin with, Sandy will do more to draw attention to issues of climate change than all the candidates running for every office in the United States during this election cycle have done. 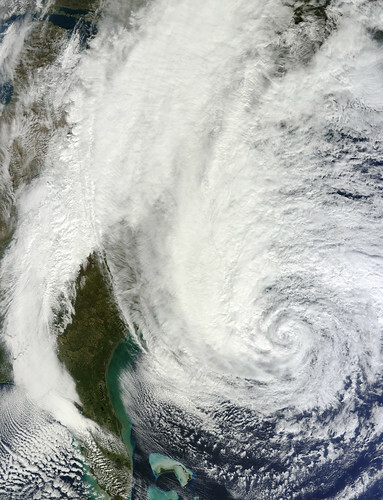 While it’s impossible to attribute her size or impact to man-made origins, it is also impossible not to wonder whether the recent frequency of large storms is related to the growing oceans of data about the reality of global warming. But, from the same magazine, there was Blake Hounshell, who was quick to ensure nobody got carried away with attributing some of the worst aspects of the storm to climate change. Hounshell also argued, “Even if the link between such storms and climate change were more solid, anything we could have done in recent years to reduce greenhouse emissions wouldn’t have mattered as far as Sandy is concerned — at this point, we’re talking about trying to limit ill effects decades from now.” This is a kind of argument of free market ideologues, which greatly serves the interests of oil companies because it essentially says why bother being more environmentally friendly. It’s not like it will change anything now. The fact is, as Climate Central’s Andrew Freedman noted, “Water temperatures off the East Coast were unusually warm. Michael E. Mann, a climate scientist at Penn State University, said that about 1 degree of the several degree water temperature anomaly can be attributed to manmade climate change.” Humans are affecting the climate. In conclusion, reporters or anchors are very into going out and standing in the middle of damaging storms to tell people what is happening. They are not telling us anything. They are not helping people understand why the storms are intensifying or why hurricane season is longer. They are not informing the public on the very real science of climate change in between standing in torrential downpours like buffoons. They are not promoting discussions on what should be the political or social response to climate change because they are not having discussions about the science of climate change. During these storms, they are pounds of flesh flailing in the wind. Their rain jackets ballooning, trees blowing wildly and the rain spraying in their face while waves crash is all part of the aesthetics of infotainment brought to you by completely worthless people incapable of using their media platform more substantially.